Cannabis as medicine is not a new idea — for thousands of years, people have used marijuana to treat a variety of health issues. The benefits aren’t limited to adults — cannabis gives relief to children around the world who suffer from painful, long-term illnesses such as epilepsy, multiple sclerosis and even cancer. And medical marijuana use is on the rise — many states have legalized medical cannabis, and an increasing number of physicians are getting certification to recommend medical marijuana to their patients. Several states currently allow licensed doctors to prescribe cannabis to children who deal with chronic disorders and aren’t helped by other types of medication. But both the benefits and the risks associated with pediatric cannabis are often misunderstood. Below, we cover all you need to know about marijuana for children, including the specific pediatric conditions that can be helped by medical marijuana and how it compares against other commonly prescribed medications. We’ll go through the risks and ways to administer cannabis, and how to register your child for a medical marijuana card. What Pediatric Conditions Can Medical Marijuana Treat? Medical marijuana has a wide range of applications in pediatric care. While it’s most commonly used to treat epilepsy and seizures, cannabis has also been shown to help in autism, neuroblastoma and other cancers and pain management. Supported by both anecdotal and research-based evidence, medical marijuana has miraculously treated epilepsy and other seizure disorders. Epilepsy is a central nervous system disorder characterized by seizures, which often result in blackouts and convulsions. During a seizure, the brain temporarily increases the number of neuron impulses every second, incapacitating the body. Approximately 400,000 children in the U.S. have epilepsy or a related disorder, and roughly one in 26 Americans will suffer from a seizure disorder at some point during their life. There are many different types of seizures, ranging from memory loss and confusion to total loss of muscle function. But regardless of the type of seizures, epilepsy comes with serious, lifelong risks. Since seizures can occur at any time, daily tasks like driving, bathing or running can be dangerous. Car accidents or sudden falls lead to broken bones and even head injuries, and if a person seizes while in water, they can drown. Psychological issues such as anxiety and depression are also common complications. Medication is the most common method of treatment, but these vary from patient to patient. Doctors typically treat seizures with drug therapy medications including anticonvulsants, but for patients with severe forms of epilepsy, a single drug is often not enough. Doctors prescribe a combination of powerful drugs for these patients to suppress their seizures. For many children, life with epilepsy means dealing with a long list of negative side effects. But it doesn’t have to be — medical marijuana is an effective alternative for treating seizures. The secret of marijuana’s medical power comes from chemical compounds called cannabinoids. These chemicals interact with the body’s endocannabinoid system (ECS) to help regulate normal body functions, including cell communication, pain reception, metabolism and more. One of these compounds, cannabidiol (CBD), affects the ECS to reduce the frequency and intensity of seizures. CBD calms the body without giving the “high” associated with other cannabinoids. While research is still ongoing, recent studies have shown CBD significantly reduces seizures in children. The Epilepsy Foundation advocates the use of medical marijuana when taken under the supervision of a trained physician, and the FDA recently backed a marijuana-derived medication, Epidiolex, for the treatment of childhood seizures. Perhaps the most compelling case revolves around Charlotte Figi, a little girl who developed a rare form of epilepsy called Dravet Syndrome when she was only 3 months old. Nothing helped Charlotte’s hundreds of weekly seizures, and as she grew older and her symptoms got worse, her parents turned to CBD oil. Now, she only has two or three seizures a month, primarily while she’s asleep. Charlotte can walk, talk and even ride her bicycle without fear. Medical cannabis provides an effective alternative to traditional epilepsy treatments and gives patients relief without the risks of conventional drugs. Medical marijuana can also benefit children who have autism. Considered a neural development disorder, autism alters the processing centers in the brain. Typically, autism manifests in behavioral symptoms such as impaired social skills, difficulty communicating and repetitive and restricted movements and behaviors. Autism is a spectrum and describes a range of conditions. While some high-functioning autistic children only experience mild symptoms, other children exhibit more severe complications — one-third of autistic people are nonverbal, and another third have some type of intellectual disability. Asperger syndrome is on the autism spectrum and is marked by intense difficulties in communication and social interaction. Children in the more severe range of the autism spectrum tend to have challenges dealing with daily life. Everything seems too loud and overwhelming, and too many things are competing for their attention. In the most serious cases, children with autism can resort to self-destructive behaviors out of frustration and from being overwhelmed. Some of these destructive habits include pulling their hair, banging their head and self-biting. If your child has autism, they may have difficulty with communication, both in understanding others and expressing themselves. Often, autistic children will appear disconnected and detached from parents and peers. They might not be able to understand another person’s view or emotions, or won’t pick up on gestures or social cues. You can treat all of these symptoms with medical weed. An increasing, worldwide body of anecdotal evidence, from both parents and medical professionals, points to CBD as an answer to the more severe side effects of autism, such as self-harm, insomnia, communication problems and seizures. Cannabis-derived products have reduced the erratic and explosive behaviors associated with the autism spectrum — with CBD oil, children can calm down and process what’s going on around them, making interaction with the world more comfortable. Several states have listed autism as a qualifying condition for the use of medical marijuana, and the research continues to support medical cannabis as an effective treatment for autistic children. Medical cannabis has been shown to help alleviate the symptoms of cancer, as well as directly fight tumors and cancerous cells. While there are more than 100 documented kinds of cancer, all of them stem from the same root problem — rapid and uncontrolled cell growth. These cells create masses called tumors, and cancerous tumors can spread throughout the body. Globally, doctors diagnose over 300,000 children with some form of cancer every year. While children can develop many different kinds of cancer, some types are specific to children, like neuroblastoma. Neuroblastoma is an aggressive and rare form of cancer that typically affects infants and children younger than 5 years old. Most often, tumors begin in nerve cells in the adrenal glands. They can spread to the rest of the body, commonly to areas around the spine or pelvis. Common symptoms of neuroblastoma include abdominal, bone and chest pain, weakness, difficulty breathing, irregular digestion and unexplained weight loss. If the tumors spread to the spine, the spinal cord may be compressed, which can lead to pain and even paralysis. The treatment of neuroblastoma and other cancers largely depend on three factors — your child’s age, the characteristics of the cancer and whether or not the tumors have spread to other areas of their body. Standard treatments are surgery, chemotherapy and radiation therapy. Chemotherapy and radiation therapy can put a child at risk for developmental delay, and other side effects include pain, fatigue and hair loss. Medical cannabis can help to alleviate the symptoms associated with cancer and its treatments, and can even attack the cancerous cells. Scientific research continues to show that the cannabinoids in marijuana are neuroprotective and have anti-cancer properties. Marijuana also has powerful analgesic properties, which help to reduce and manage the pain associated with childhood cancer and cancer treatments. For children who have multiple sclerosis, medical cannabis could provide welcome relief from spasms and pain. MS is physically debilitating — over time, the patient deteriorates to the point where they are unable to care for themselves. Currently, researchers haven’t discovered a cure for MS, and its causes are still unknown. Since there is no cure, prescribed treatments for MS revolve around one of three objectives — manage current symptoms, shorten the recovery time after attacks and alter or slow the progression of the disease. Often, these medications come with their own list of side effects, including increased blood pressure, insomnia, fluid retention, mood swings and a decreased immune response. Medical marijuana is proving to be an effective alternative. Cannabis primarily helps by lessening the stiffness and uncontrolled muscle spasms that accompany MS, which reduces the severity of related symptoms such as incontinence, coordination and balance issues, tremors and loss of dexterity. MS also causes intense nerve pain, which marijuana can also treat — new studies show that cannabis relieves neuropathic pain, which helps with related symptoms like insomnia. Cannabis is anti-inflammatory, which can help with the motor control problems and weakness caused by MS. Many MS patients will struggle with depression as they learn to live with the disease. Medical marijuana has antidepressant properties and helps relieve the emotional and physical strain of MS. The pain-relieving effects of cannabis are well-known, and medical marijuana can be used to treat intense pain in children. Whether your child’s pain is chronic or a result of a deeper illness or complication, living with constant, deep pain is debilitating. Children can suffer from a weakened immune system, insomnia, social isolation, withdrawal and mood changes. Often, doctors prescribe powerful medications like opioids to patients to control pain, but these drugs come with serious side effects that can lead to addiction, dependence and overdose. Alternatively, CBD offers similar pain-relieving results as traditional pharmaceutical pain-killers but without the dangerous side effects. Cannabis can also target many different types of discomfort, including muscle, neuropathic, psychological and emotional pain. CBD gives your child relief from pain without the “high” of other cannabinoids or the cloudy haze of opioids. Medical cannabis doesn’t carry the same risk of dependency as opioids, making it a safer, and more affordable, treatment for your child’s pain. Many mainstream pain management drugs are slightly to severely addictive, which is a particular concern when children are involved. If the child ever recovers from their illness, overcoming their painkiller addiction can be yet another painful step to the process. Cannabis oil, like other medical marijuana products, is non-addictive, which makes it a safe alternative for many mainstream drugs. Cannabis oil is made with cannabis extract, a substance that contains concentrated amounts of CBD. This substance is also weak in THC, the compound with hallucinogenic properties. When using CBD oil, children get all the benefits of the substance without the side effects. 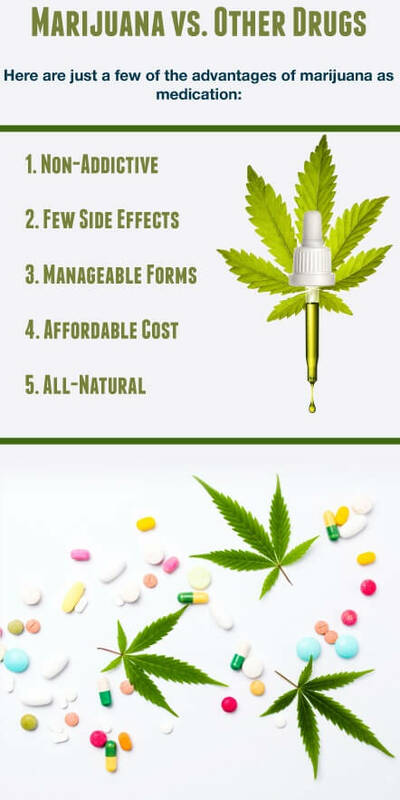 This is a significant advantage cannabis oil has over many pharmaceutical options, as opiate painkillers and synthetic drugs often have negative side-effects that alter a child’s cognitive, motor or organ functions. It’s also impossible to overdose on marijuana, making it much safer than other pain medicines like opioids. While medical cannabis will affect every child differently, the risk for adverse side effects is much less than with other medications. Cannabis oil comes in many forms, making it easier to use for parents and children. While smoked marijuana offers many benefits, few children are willing or able to smoke marijuana in the quantities need to benefit from the plant, and it’s not recommended for young lungs. Cannabis oil, on the other hand, offers all the benefits without the smoke inhalation or psychoactive side effects. Cannabis oil can also be added to drinks or foods to accommodate children who are sensitive to certain tastes and textures. While the exact cost of medical cannabis varies depending on every individual circumstance, it is often much cheaper than traditional medications. CBD oil for children usually costs around $200 a month and edibles can be even more affordable. Many of the conventional medicines prescribed to children are synthetic, or derived from man-made chemicals. Alternatively, CBD oil comes directly from the cannabis plant with little to no chemical manipulation. Marijuana interacts with the body’s existing endocannabinoid system, providing a sustainable and natural alternative to synthetic medications. Parents often face challenges when they first explore the option of cannabis treatment — common stereotypes claim that marijuana will lower a child’s IQ and that there isn’t enough research to make it a viable treatment option. Here are a couple of the most common questions revolving around the use of marijuana for pediatric treatment. This is a common viewpoint — both within the medical community and the legal community, primarily due to the relatively small amount of research in the areas of pediatrics and cannabis. This lack of investigation is first and foremost because federal law has prohibited marijuana studies. Since the criminalization of marijuana under federal legislation in 1937, science labs across the United States have been unable to pursue research without penalization. The majority of research today is based on individual testimony, often without controlled studies — and under such conditions, these claims cannot be verified. And with medical marijuana still classified as a Schedule 1 drug at the federal level, these restrictions inhibit medical marijuana studies that could persuade more physicians to consider treatment plans using medical marijuana. Because marijuana isn’t a federally recognized medication, it isn’t subject to the same level of regulation as other drugs. Cannabis-based products may not have been tested for heavy metals, pesticides and herbicides, pollutants or pathogens such as bacteria or mold. Some have raised concerns about the accuracy of the labeling of cannabis and marijuana-derived products. This makes the development of FDA-approved drugs like Epidiolex exciting — now the government can regulate dosages and labeling of cannabis-based medicines, making sure you know exactly what you’re getting. Another marijuana-derived drug, Sativex, has been approved in over 20 countries for treating children suffering from neuropathic pain and multiple sclerosis. The future looks promising. The U.S. Drug Enforcement Administration (DEA) is currently establishing an Administration Controlled Substances Code Number to label a compound as a “marijuana extract,” which will allow the DEA to further monitor the amounts of THC and CBD contained in products. Regardless, if you are considering using medical cannabis for your child, buy products from a licensed dispensary to make sure you are getting high-quality products. Ultimately, every child will respond differently to cannabis. This means that many parents have to go through a trial and error period where they test out different dosages and methods of ingestion to find the right balance for their child. The right combination of cannabinoids also varies between patient — while one child will respond to a specific CBD-to-THC ratio, a different variation might work better for another. Also consider the time of day and frequency of treatment — will your child need marijuana-based medication twice a day, or do they only need something before they go to bed? Before you begin medical marijuana treatment for your child, consult with a licensed physician. They can help guide you through this process so you can quickly find the perfect dosage and method for your child. When most people think about marijuana, they assume it’s only smoked. But this is far from the truth — you can consume cannabis in a wide variety of methods, ranging from gummy bear edibles to CBD oils. While edibles are an easy way to treat your child, they do have a few downsides. One is the lagging effect — edibles often take a few hours to fully take effect, which isn’t very helpful in situations where your child needs immediate relief. However, once the edibles kick in, the effects are stronger than inhaled products. You must also be careful to keep edibles locked and out of reach of children and pets. Tinctures are medicines made from dissolving a substance in alcohol. They can come in topical or oral forms and are administered using a dropper. You can add a few drops of a cannabis tincture into substances like tea or apply directly under the tongue. Tinctures act faster than edibles, and it is easy to control the exact dosage. They also have the benefit of mild flavors, which will help some children. Some tinctures come as sprays, and these are typically administered orally by spraying into the mouth. Cannabis tinctures are an affordable ingestion method if your child only needs small doses of weed — when used in high quantities, tinctures can become expensive. Topicals are often fast acting and locally applied to the place where you’re experiencing pain or discomfort. Different forms have different reaction times — while lotions and creams often act quickly, patches provide a steady, constant relief for longer stretches of time. Pediatric treatment with marijuana falls under many of the same laws as medical marijuana for adults, with a few additional restrictions. Medical marijuana treatments are available for very young children in all states that allow medical marijuana prescriptions. No age requirement currently exists for medical cannabis because of its use as a medical treatment. Discussion With a Physician: The patient’s parents or legal guardians must discuss the risks and benefits of medical marijuana before treatment can begin. Two Written Certifications: The patient’s parents or legal guardians must submit written certifications from two physicians to the regulatory entity. A Parent or Guardian’s Consent: The patient’s parents or legal guardians must consent to the treatment in writing, verifying that they will allow the patient to use marijuana in a medical capacity, will serve as the patient’s primary caregivers and will control the acquisition, dosage and usage of their medical marijuana. Medical Proof of Condition: To register for a medical marijuana card, you must present medical proof that your child suffers from a condition that is approved in the medical marijuana program. Additional stipulations and requirements may vary by state. Be sure to check with the local law before pursuing a medical marijuana treatment plan for your child. Medical cannabis could provide the relief your child needs. Let us help. At MarijuanaDoctors.com, we can connect you to hundreds of certified marijuana doctors across the country, as well as locate licensed dispensaries in your area. Schedule an appointment and help your child begin their path to healing today. No Information on MarijuanaDoctors.Com should be used to diagnose, treat, prevent or cure any disease or condition. You can view our Full Disclaimer here.